We are happy to post here the results, methods, data, scripts, and phalanx of papers for the Food and Drug Administration’s (FDA) Sequencing Quality Control (SEQC) Study on RNA-Sequencing (RNA-Seq) and the Association of Biomolecular Resource Facilities (ABRF) Phase I Study on Next-Generation Sequencing (NGS), which focused on RNA-seq. These 10 complementary studies have focused on all aspects of RNA-sequencing, including: RNA quality, library preparation, sequencing, alignment, quantification, normalization, integration, and concordance. The overarching goal was to establish robust measures and methods for of inter-site and inter-platform RNA-seq concordance, which is critical for clinical applications, self-evaluation/improvement, and technology and informatics development. The FDAs SEQC/MAQC-III Consortium. “A comprehensive assessment of RNA-seq accuracy, reproducibility and information content by the Sequence Quality Control consortium.” Nature Biotechnology. 2014. Aug 24. 2014 Aug 24. PMID: 25150838. Li S, Tighe SW, Nicolet CM, Grove D, Levy S, Farmerie W, Viale A, Wright C, Schweitzer PA , Gao, Kim D, Boland J, Hicks B, Kim R, Chhangawala S, Jafari D, Raghavachari N, Gandara J, Garcia-Reyero N, Hendrickson C, Roberson D, Rosenfeld JA, Smith T, Underwood JG, Wang M, Zumbo P, Baldwin DA, Grills GS, Mason CE. “Multi-Platform Assessment of Transcriptome Profiling Using RNA-Seq in the ABRF Next Generation Sequencing Study.” Nature Biotechnology. 2014 Aug 24. PMID: 25150837. Li S, Labaj P, Zumbo P, Shi W, Phan J, Wu L, Wang M, Thierry-Mieg J, Thierry-Mieg D, Shi L, Kreil D, Mason CE. “Detecting and Correcting Systematic Variation from Large-scale RNA Sequencing.” Nature Biotechnology. 2014. Aug 24. PMID: 25150837. Wang C, Gong B, Bushel PR, Thierry-Mieg J, Thierry-Mieg D, Xu J, Fang H, Hong H, Shen J, Su Z, Meehan J, Li X, Yang L, Li H, Labaj PP, Kreil DP, Megherbi D, Gaj S, Caiment F, van Delft J, Kleinjans J, Scherer A, Devanarayan V, Wang J, Yang Y, Qian HR, Lancashire LJ, Bessarabova M, Nikolsky Y, Furlanello C, Chierici M, Albanese D, Jurman G, Riccadonna S, Filosi M, Visintainer R, Zhang KK, Li J, Hsieh JH, Svoboda DL, Fuscoe JC, Deng Y, Shi L, Paules RS, Auerbach SS, Tong W. The concordance between RNA-seq and microarray data depends on chemical treatment and transcript abundance. Nat Biotechnol. 2014 Aug 24. PMID: 25150839. 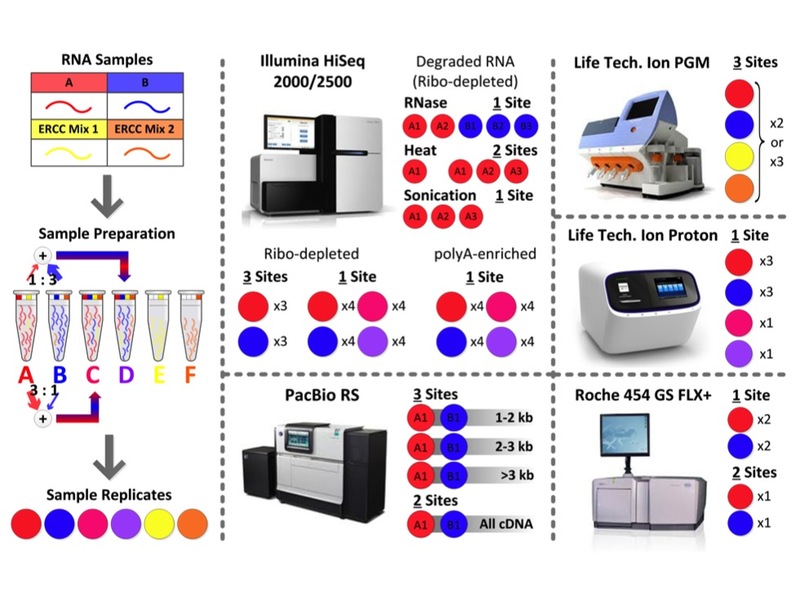 Xu J, Su Z, Hong H, Kreil D, Mason CE, Tong W, Shi L. Cross-platform ultradeep transcriptomic profiling of human reference RNA samples by RNA-Seq.” Scientific Data. 2014. Aug 26. Yu Y, Zhao C,Su Z, Wang C, Fuscoe JC, Tong W, Shi L.. Comprehensive RNA-Seq transcriptomic profiling across 11 organs, 4 ages, and 2 sexes of Fischer 344 rats. Scientific Data 1: 140013. 24 June 2014. Gong B,Wang C, Su Z, Hong H,Thierry-Mieg J, Thierry-Mieg D, Shi L, Auerbach SS, Tong W, Xu J. Transcriptomic profiling of rat liver samples in a comprehensive study design by RNA-Seq Scientific Data 1:140021. 26 August 2014. Yu Y, Fuscoe JC, Jia M, Guo C, Qing T, Bannon DI, Lancashire L, Bao W, Du T, Su Z, Chao C, Jones WD, Moland CL, Ning B, Qian F, Li Y, Hong H, Mei N, Shi T, Wolfinger RD6, Nikolsy Y, Tong T, Thierry-Mieg J, Thierry-Mieg D, Mason CE, Shi L, Wang C. “Landscape of rat RNA-Seq transcriptomic BodyMap throughout the life cycle.” Nature Communications. 2014 Feb 10;5:3230. PMID: 24510058. Rapaport F, Khanin R, Liang Y, Krek A, Zumbo P, Mason CE, Socci ND, Betel D. “Comprehensive evaluation of differential expression analysis methods for RNA-seq data.” Genome Biology. 2013. Sep 10;14(9):R95. PMID: 24020486. Yu Y, Fuscoe JC, Zhao C, Guo C, Jia M, Qing T, Bannon DI, Lancashire L, Bao W, Du T, Luo H, Su Z, Jones WD, Moland CL, Branham WS, Qian F, Ning B, Li Y, Hong H, Guo L, Mei N, Shi T, Wang KY, Wolfinger RD, Nikolsky Y, Walker SJ, Duerksen-Hughes P, Mason CE, Tong W, Thierry-Mieg J, Thierry-Mieg D, Shi L, Wang C17. 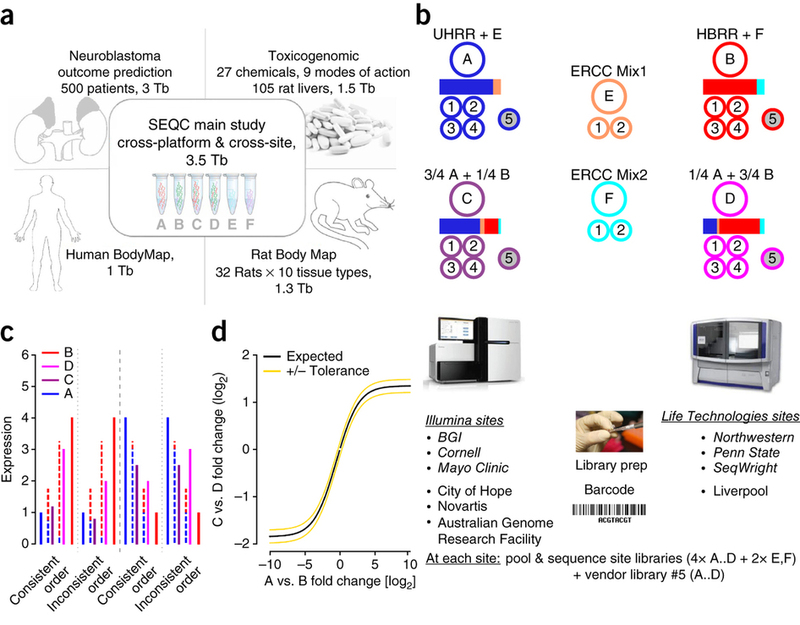 A rat RNASeq transcriptomics BodyMap across 11 organs and 4 developmental stage.. Nat Commun. 2014;5:3230. Assessment of transcript reconstruction methods for RNA-seq. Steijger T, Abril JF, Engström PG, Kokocinski F; RGASP Consortium, Abril JF, Akerman M, Alioto T, Ambrosini G, Antonarakis SE, Behr J, Bertone P. Nat Methods. 2013 Dec;10(12):1177-84. doi: 10.1038/nmeth.2714. Epub 2013 Nov 3. Systematic evaluation of spliced alignment programs for RNA-seq data. Engström PG, Steijger T, Sipos B, Grant GR, Kahles A; RGASP Consortium, Rätsch G, Goldman N, Hubbard TJ, Harrow J, Guigó R, Bertone P. Nat Methods. 2013 Dec;10(12):1185-91. doi: 10.1038/nmeth.2722. Evaluation of quantitative miRNA expression platforms in the microRNA quality control (miRQC) study. Mestdagh P, Hartmann N, Baeriswyl L, Andreasen D, Bernard N, Chen C, Cheo D, D'Andrade P, DeMayo M, Dennis L, Derveaux S, Feng Y, Fulmer-Smentek S, Gerstmayer B, Gouffon J, Grimley C, Lader E, Lee KY, Luo S, Mouritzen P, Narayanan A, Patel S, Peiffer S, Rüberg S, Schroth G, Schuster D, Shaffer JM, Shelton EJ, Silveria S, Ulmanella U, Veeramachaneni V, Staedtler F, Peters T, Guettouche T, Wong L, Vandesompele J. Nat Methods. 2014 Aug;11(8):809-15. doi: 10.1038/nmeth.3014.